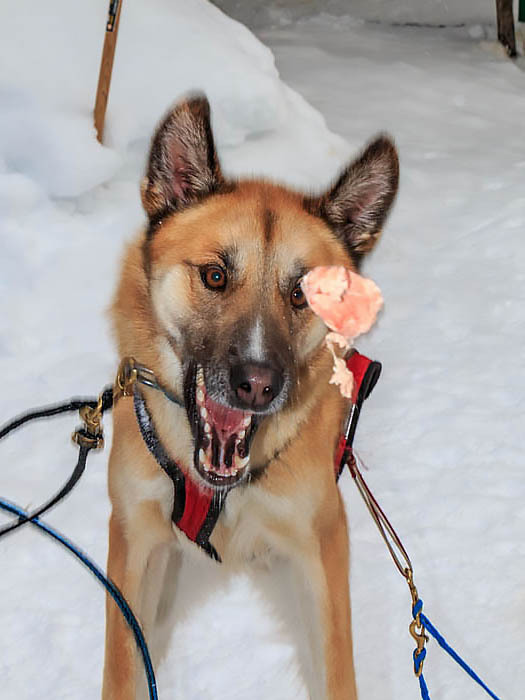 Caption: At the end of a sled dog tour with Mountain Man Dog Sled Adventures, the dogs are tossed chunks of meat fat, which they need in winter for fuel. Comments: At the end of a sled dog tour with Mountain Man Dog Sled Adventures, the dogs are tossed chunks of meat fat, which they need in winter for fuel. Most sled dogs are NOT Siberian Huskies but, rather are a crossbreed of many dogs that are lean and fast. The crossbreed is called Alaskan Husky.